Bordering Asia and Europe, Turkey is a natural bridge between the two worlds of the West and the Orient. Turkey boasts amazing diversity in its geography, geology and climate, varying from extremes such as the subtropical forest of the Black Sea coast to the evergreen pine forests of the Mediterranean, snow-capped mountains, rolling steppe and rich agricultural valleys. Such a diverse country lends itself to fantastic walking and cycling holidays and Sherpa Expeditions offers a range of guided and self-guided tours to help you get the most out of your time in Turkey. The Lycian Way is one of Turkey's most famous walking trails. The full trail is 500kms long, however our range of walking holidays along Turkey's Lycian Way takes in the highlights of the trail. 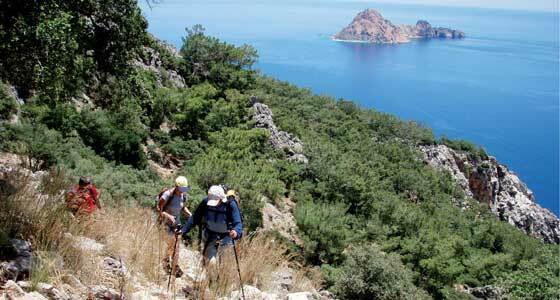 You can choose to walk the well-marked Lycian Way on a guided or self-guided walking holiday. Cappadocia is a surreal landscape of conical shaped, limestone formations. Its contrasting moonscapes and valleys filled with rock-hewn churches and dwellings and fairy chimneys are nestled under the snow-capped mountains of Mount Aergius. It is primarily an agricultural region due to its rich, mineral laden soil; however, much wealth is generated from its famous carpet weaving and tourism. 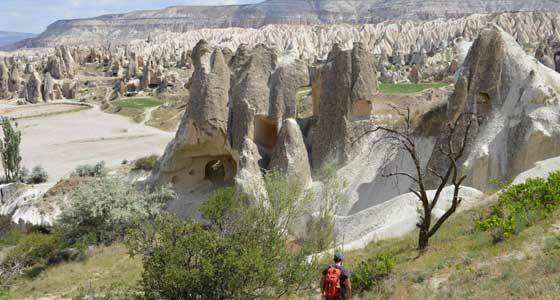 Discover this martian landscape on our self-guided Cappadocia on Foot walking holiday. 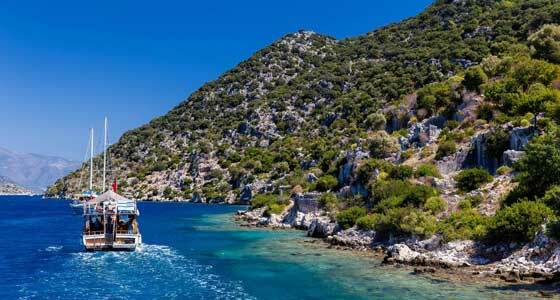 Another popular way to explore Turkey's Lycian Coast is on a walk and sail holiday, where you walk during the day then retire to the comfort of your Turkish gulet each evening. Our Turkey Walk and Cruise will help you explore the coastline and islands between Marmaris and Fethiye on foot from a comfortable Turkish gulet base. The Central Anatolian region of Cappadocia has hot and dry daytime temperatures between 20-30 degrees Celsius and cool nights between 10-20 degrees Celsius, throughout our recommended walking season from May to October. The Aegean experiences a hot and humid climate during summer (May – September) with temperatures rising to over 40 degrees Celsius at times. Average temperatures for this period are between 15 and 32 degrees Celsius. Rainfall at this time is at its lowest. The Mediterranean experiences similar weather patterns to the Aegean, although temperatures are slightly hotter ranging from 16 – 33 degrees Celsius between May and September. Again, May to September is the dry season. Given the heat in the high summer we recommend that spring (March - May) and late summer-autumn (August-November) are the best times to visit the Lycian Coast region.